Our SMS API will help you send millions of messages worldwide within 10 seconds at the highest quality. Connect your website or application to our SMS API for reliable global messaging - benefit from 60+ direct carrier connections to deliver your SMS. We offer API's and SDK's in multiple languages. How to start using our SMS API? We have combined all of our messaging APIs (SMS, WhatsApp, Facebook Messenger and more) into one Business Messaging API. Explore our API below or keep on reading to find the benefits of one Business Messaging API. Want to expand your reach even further? The CM.com platform is not limited to SMS. You can expand your reach by adding multiple messaging channels to the conversation. Examples of these channels are WhatsApp, Facebook Messenger, Viber and more. SafariNow uses our SMS API to notify its bookers and sellers of booking confirmations, incoming quotes, inquiries and cancellations. The DA uses our multichannel API to deliver OTP via Push with SMS fall back, therefore reducing the cost of sending OTP's. In addition, they use SMS Campaigns for marketing messages. Popchef uses our SMS Gateway API to keep their customers informed about the status of their orders. Our platform ensures quality of service and reliability of delivery. Software plugins and extensions are fast and easy options to extend the functionality of your platform. They enable you to implement our services into your own software through plug-and-play extensions. You can find the SMS Gateway API for developers as a plugin. Explore all options on our integrations page here. Our pro-active monitoring guarantees fastest delivery of time critical messages in high volumes. Delivery rate and speed are constantly measured by live test results. Our platform is connected to 1000+ operator networks in 195 countries. This means that you can benefit from high quality routes at the best price. With high uptime and a redundant setup, you can rely on our highly secure and ISO 27001 certified platform with 24/7/365 support from our Network Operations Centre. Our powerful Analytics tool gives you a real-time and detailed overview of your worldwide traffic so you can track, trace and optimize flows. Messaging Analytics offers detailed insights into your SMS communication and real-time trends, so you can directly optimise your mobile strategy. Direct operator connections alone are not enough. You also need messaging routes that have been thoroughly tested on quality and speed. We have developed our own testing product called Texter, which we constantly use to ensure the safety, quality and speed of your SMS delivery. ﻿For Randstad, we need and use CM.com's services to quickly and reliably send messages: for us time is money. Previously, it merely went through the phone calls. SMS via CM.com has eliminated this labor-intensive process. 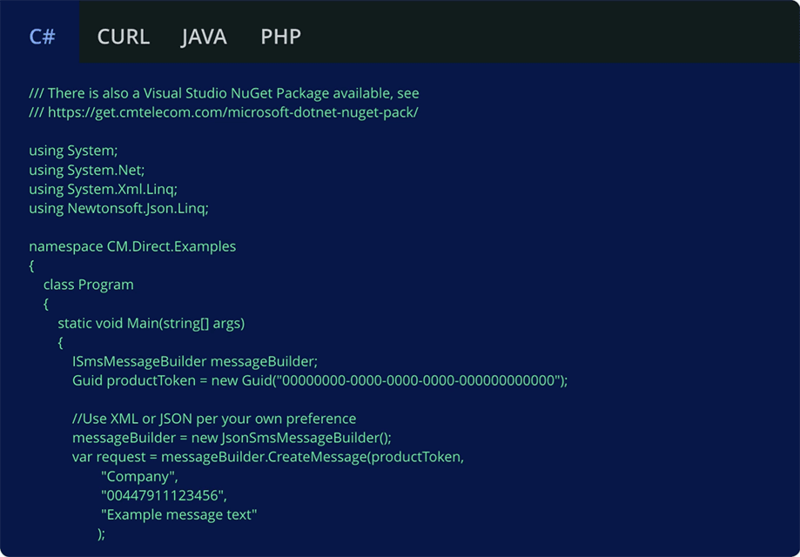 The SMS API from CM.com makes our tool even more powerful. Direct communication is very important to us. Now, our customers can quickly and easily pass on important updates during an event. This way, Beeple customers can save a lot of time and effort on, for example, telephone calls.